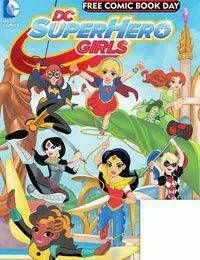 DC Super Hero Girls is an exciting new universe of superhero storytelling that builds character and confidence and empowers girls to discover their true potential. This special FCBD issue features two exciting, action-packed stories from the upcoming original graphic novel DC SUPER HERO GIRLS: FINAL CRISIS that readers of all ages will enjoy. Its the day before finals and the student body is hard at work...and nothing is going right! Wonder Woman spars with Cheetah in gym class as Batgirl and Supergirl watch from the sidelines. In the next class, the girls sit next to an empty seat. Where could Supergirl be?